We are starting an Open Knitting Night. It will start this Thurs (July 1) and be held the 1st Thurs of the month. There is no charge and you can bring whatever you are knitting. The time is from 5-8 pm. we will have door prizes, free patterns to hand out and a show and tell. Grab a friend and come on down! Speaking of show and tell, anyone who was in last week knows about the pig I was knitting. I say was because, I finished it and it is so cute! It is a pattern from Itty Bitty Toys by Susan B. Anderson that I spoke about a few weeks ago. 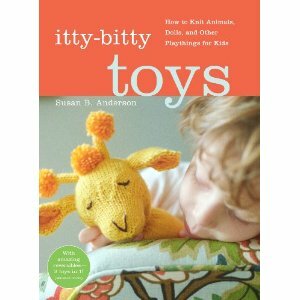 This is a wonderful knitted toy book with at least 4 things I still want to knit! I have also started a baby sweater using a new yarn from Schoeller/Stahl. It is a sportweight yarn that feels like a bamboo. It is called BATIKA and it looks like tye dye when knitted. Hopefully I will be set up in a week or so to have photos on the blog so you can see what I am doing and the projects for classes. I am very excited about this possibility! I almost forgot to tell you that the Hiya-Hiya interchangables in the larger sizes came in today. Sizes are 9-15, with cable for 16, 24, 32, and 40″. There are 15 sets, so if you want 1 call the store.